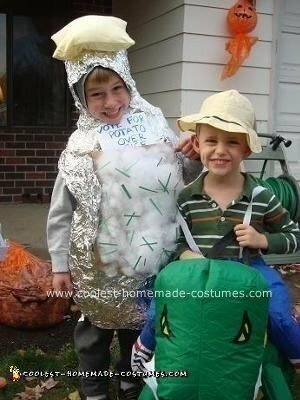 This Baked Potato Costume ended up being a last minute costume with very little prep. The only thing we did the night before was to sew the little “pat of butter” hat. To do that, I used leftover yellow flannel from a blanket I made. I sewed it into a quick square and stuffed it with cotton batting. 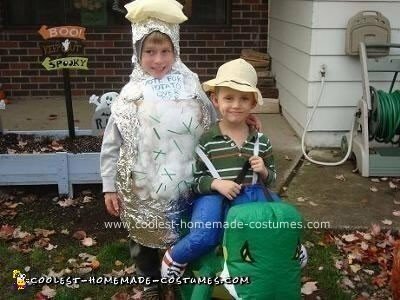 I had silver ribbon that we just saftey pinned to the sides of the hat and then tied it under his chin. The rest of the costume was made on the fly about an hour before he wanted to head out for trick or treating. We dressed him up in gray sweats and stuffed a pillow around his belly to bulk him up. Next, we used heavy duty tin foil and wrapped it around his body about 10 layers thick also going around his head to form a hood. Then, we carefully cut a slit down the front through the first 3 layers. I pulled this back and used a hot glue gun to glue a layer of brown paper bag inside (to look like the potato skin). Over the top of that, I glued cotton batting puffed up to look like the inside of a potato. To this, we glued some small strips of green paper to look like chives. We found that as he walked around, he was losing stuffing, so we finished the costume by wrapping him with a few layers of clear packing tape. 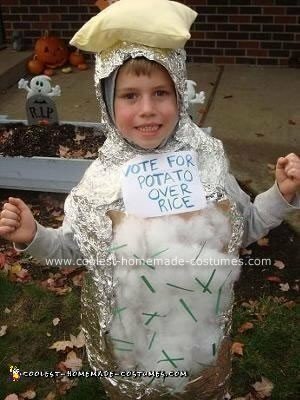 This held everything together well, but we had to cut him out of the costume at the end of the night.